Evgeny Svetlanov has always held a prominent position in the catalogue, but in recent years a good number of forgotten recordings have surfaced on various labels. ICA and Testament have been issuing recordings from London and Berlin, while Melodia has been mining its archives for recordings with Russian orchestras. These have been particularly interesting for the neglected Russian repertoire that Svetlanov championed – and usually performed to the highest standards – notably Arensky, Weinberg, and here Taneyev. 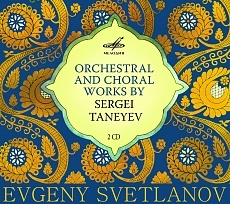 This collection gives a good survey of Taneyev’s most popular works. It’s an excellent starting point for anybody wanting to know more about the composer. It is also competitive with the very best in each of the works presented. The programme is front loaded, opening with the wonderful First Cantata, “John of Damascus”. The cantata is funereal in tone (it’s dedicated to the memory of Taneyev’s recently deceased teacher Nikolai Rubinstein). The two strongest currents in Taneyev’s work, his broad Romantic expression and his interest in Medieval counterpoint, come together here in a work of extraordinary power and conviction. And Svetlanov really makes the most of it, giving a grand heart-on-sleeve interpretation that never sidelines any of the essential contrapuntal details. Despite its uninspiring name, the Academic Choir of the USSR All-Union Radio sings with passion and commitment. Particularly impressive is the way that counterintuitive balances are achieved to clarify the unusual counterpoint. For example, in the very final chord, the tenors almost overpower the rest of the chorus, but this is clearly the sound Taneyev had in mind. A more recent recording of the cantata by Mikhail Pletnev on DG is also impressive, and has superior sound. But Svetlanov achieves a greater sense of dramatic sweep, making this the version of choice. Taneyev’s Fourth Symphony is a better-known quantity, with at least five recordings in the catalogue. But this too is a very convincing reading, and all the more so for the distinctively Russian sound of the orchestra, the earthy strings and blaring brass. Svetlanov again achieves an ideal balance of drive and breadth, giving a suitably symphonic feel. The Adagio second movement is particularly impressive, slow and expansive, but without ever seeming to sprawl or lose its way. The Suite de Concert (here rendered as Concert Suite) is Taneyev’s only venture into concertante music. It is not a violin concerto as such, more a collection of symphonic dances with violin solo. Nor is it one of Taneyev’s finest works, although it has remained popular, largely thanks to the advocacy of high profile Russian violinists, notably Oistrakh. Andrey Korsakov gives an impressive reading here, technically secure and delivered with real conviction. He and Svetlanov are of common mind in terms of the drama and weight they apply to this music. Sometimes it goes too far, as in the second movement Gavotte, which feels burdened by the heavy accents and in need of a lighter touch. But Taneyev’s orchestration, imaginative as it is, always allows the soloist to predominate. He may be given a helping hand by the audio, either in the original edit or in the remaster, but it is a fairly subtle balance shift. The audio throughout is fine, nothing special but as good as can be expected from late Soviet technology (the recordings date from 1984-90). There is always plenty of clarity, though sometimes a lack of presence, with the wind and brass in particular lacking bloom. To conclude, “Temple of Apollo at Delphi”, scene change music from Taneyev’s opera The Oresteia. This is a great little piece, starting out with atmospheric harps, in the spirit of the opening of Khovanshchina, and building to a grand processional, almost worth of Lohengrin. But there’s no forgetting this music’s Russian origins, nor those of the recording. The blaring Russian trumpets completely dominate the climax, just as they should. It’s only six minutes, but it’s a great way to close the programme. A slightly frustrating one though, given that this and the overture are all that’s currently available of what is apparently one of the greatest Russian operas of the 19th century.